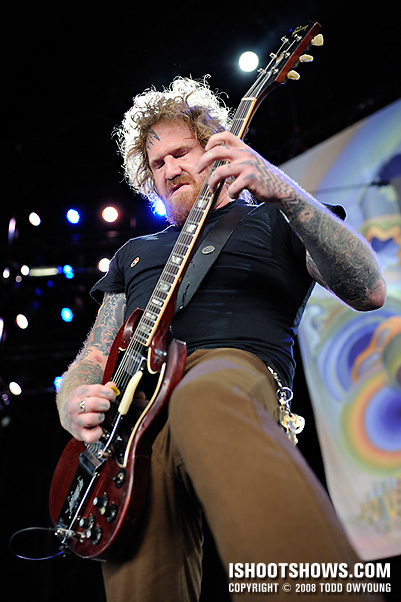 Grammy-nominated progressive metal band Mastodon opened up the main stage at the Rockstar Mayhem Fest with a thundering 40-minute performance at the Verizon Wireless Amphitheater. 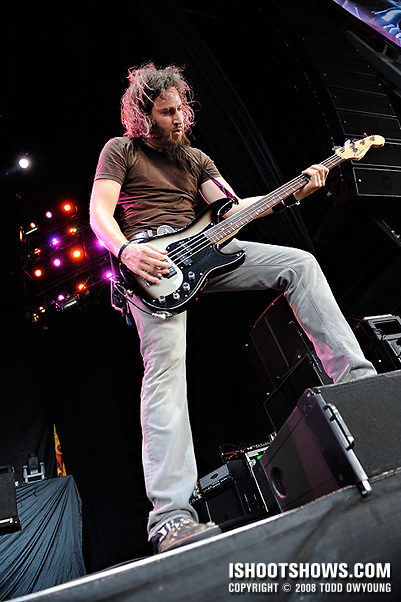 The Atlanta, Georgia-based band, who weighs in with quite possible one of the most epic band names in recent memory, was led with the double-barreled attack of Troy Sanders and Brent Hind on bass and guitar, respectively. 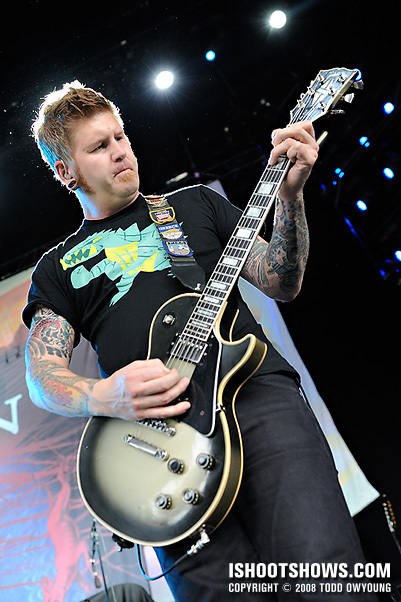 Sanders and Hind traded off duties on vox while guitarist Bill Kelliher and drummer Brann Dailor completed the band's critically acclaimed sound of complex time signatures, extended melodic riffs, and gutteral vocals. 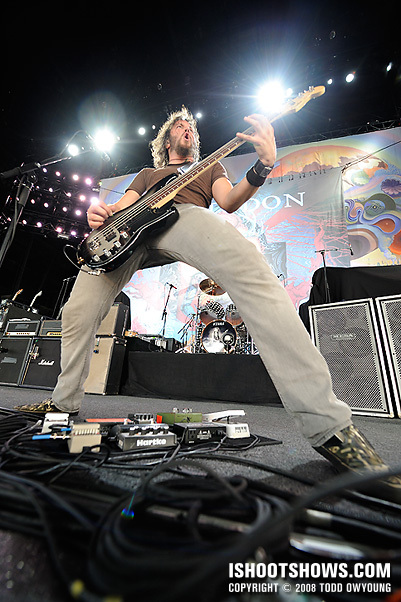 In the moments before beginning the set and launching into the crushing metal, Troy Sanders was already locked into the power stance, winding up. 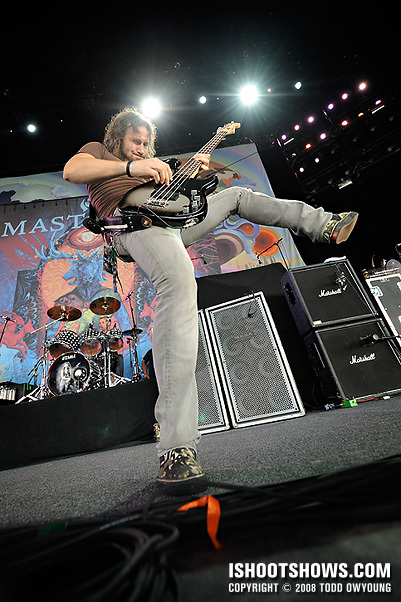 The frontman shifted his weight between his two feet, bass slung low across his hip, and he leaned farther back with each pull. He couldn't wait to unleash the beast. Needless to say, this set was just plan fun. When photographing a band that puts such an incredible amount of energy into their live performance, I think one can't help but feed off that energy. I photographed about half of this set, or just under 20-minutes in the pit. 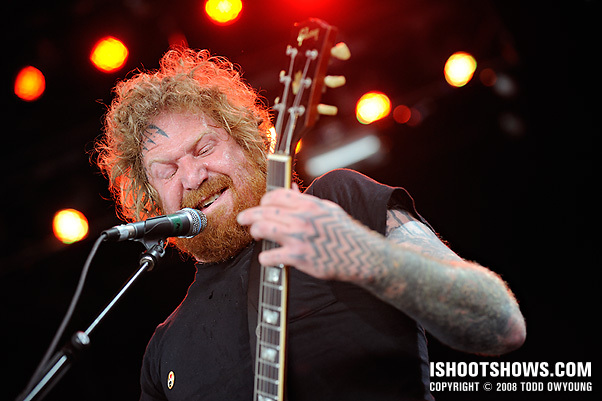 I left a little early, thinking I would have more trouble getting over to Underoath's stage, but I would have loved to shoot more of Mastodon's set. Overall, I used the 14-24mm a lot, so if you're shooting these guys, bring your wide. 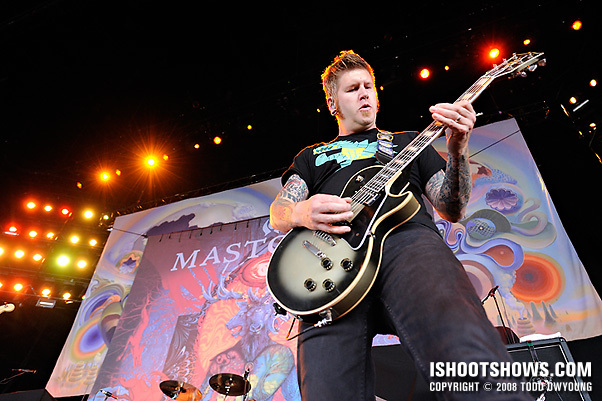 As a matter of fact, bring it all, Mastodon is photo-candy – you can't really go wrong with any lens. The 70-200mm also got a good workout for tighter shots of the crew. A huge gigantic thanks to Amanda for setting everything up for Mastodon. Thanks for the feedback, glad to hear you like the wide shots. 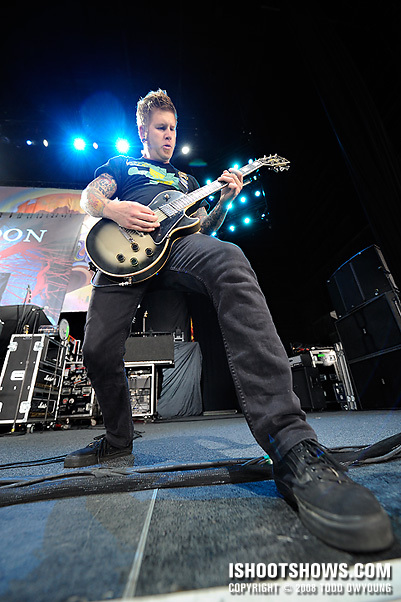 Mastodon is one band that loves the extremes, be it wide-angle or telephoto. If pressed, I probably could have shot this without the 24-70mm. Thanks again! Rockin! It’s so cool to see some crystal clear shots with just white lights and no other colors. I really like 3, 5, and 6, as well as the wide angle shots used with the 14-24. That is SUCH a cool lens, but you can really see the distortion in the shots with Kelliher (in fact, I almost feel like too much distortion in this one , but love the others – the lens just gives such a cool feel to the photos). Additionally, I think the 70-200 complemented the set well and added a nice touch of tight framing on their faces — something you can never go wrong with, as seen in the last photo. Great set, man. Nice to see you’re back! 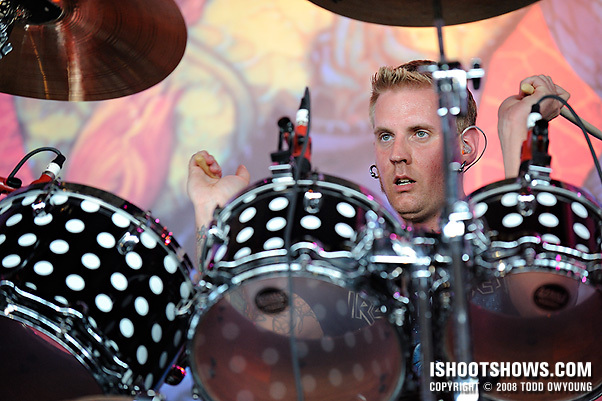 I thought that the lighting for this set was great, maybe even better than that of DragonForce, which got a little too much of the warm glow of the setting sun at the end of their set. 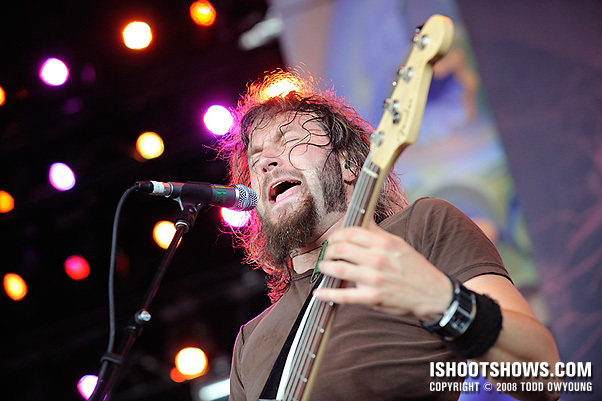 Mastodon, however, had the benefit of diffuse,indirect daylight and the nice stage lighting. Thanks for your picks, you choose some of my favorites that I frontloaded in the post. I can see what you mean about the distortion in that shot, which is why I always make sure I’ve got my more standard shots of performers as well. 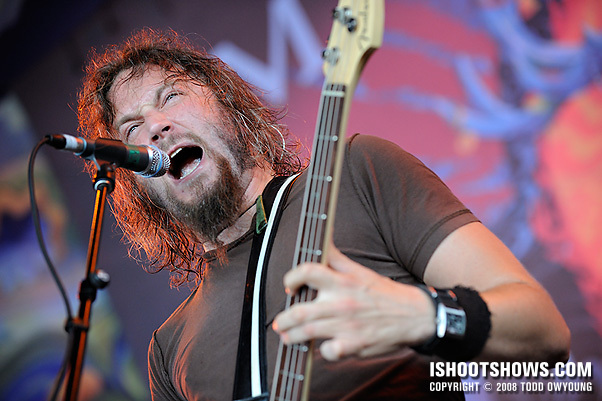 As I mentioned to Celso, this band is one that response really well to the more extreme focal lengths. Or maybe it’s more accurate to say that they’re good at any focal length, including those on the ends! Thanks again, as always, for the feedback. I’m bummed you couldn’t make it out for this one, but we’ll line something else up soon. Always great to see pics of a band I love. Tons of energy in those shots. I need to see these guys live for myself! Hey Jason, I’m glad to hear that, as a fan of these guys, you approve. Hope you get to see them live, they put on a fantastic performance. The energy they put into their set is mindblowing. Fabulous shots! I’m beyond impressed with how clear you were able to get these with the obvious amount of movement the band was making. Was that all shutter speed or did you have some additional tricks up your sleeve? Hey Keath, thanks. I’ll have to look back at the exact exposure, but I was keeping the shutter speeds plenty high for this set. I was probably somewhere around 1/500, f/3.5, and ISO 1600. The shutter speeds could have been even higher. ISO 1600 is so clean on the D3 that I have no problem what so ever using it for well lit gigs like this because I know the boost in shutter speeds is necessary. Nice shots as usual Todd. I love the perspective on those wide angle shots. That’s ridiculous that you can get clean shots like that at 1600. Hey Chad, thanks for the comment. Glad to hear your thoughts on the wide shots. ISO 1600 on the D3 is my favorite sensitivity right now. The files are just so clean, it’s easily 2-stops better than my D2x at the same setting. The noise-reduction setting for this ISO is zero in regards to user-selectable NR. ISO 3200 and 6400 are very nice, but ISO 1600 on the D3 is just beautiful. I’ll do a post on high ISO noise in the near future where I can post some 100% crops and such. Thanks Todd! I’m shooting Projekt Rev this weekend so I’m trying to gather tips on reducing blur in my shots. The advice and amount of time you spend here helping all of us out is much appreciated, believe me! Stopping blur really depends on the performers, and it may take anywhere from 1/160 to over 1/500. For the most active bands, I’ll go to 1/1000 and up if I can. I love your site. 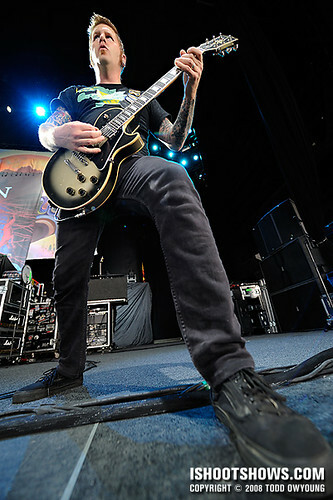 I also love the way you’ve started a dialog among concert photographers and are willing to help us newbies out. I’ve just begun shooting shows in a serious way. I started with the D300 (The three major 2.8 zooms and a handful of fast primes). Just upgraded to the D700, best body I can afford. In that vein, a few questions. What is your approach to focus? How much post-shoot color-correction/sharpening do you do? What size/compression raw files do you shoot? Any help you could offer would be greatly appreciated. By the way, I really love the wide angle distortion in these shots. It adds so much life and puts you right there in the middle of the action.